Hours: 9:00 am - 5:00 pm daily. 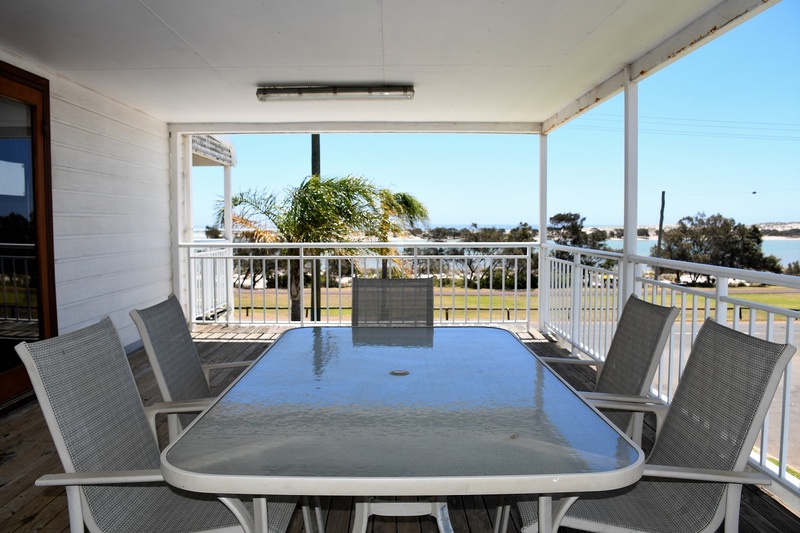 Quality holiday accommodation in the heart of Kalbarri with sensational ocean and river views. Stay where the sunset meets the sea. Your hosts Jamie & Fay go out of their way to make sure your Kalbarri experience is truly memorable. 2 bedroom fully self contained villas with ocean and river views, and some at the rear without views. -1 bedroom fully self contained villas upstairs, some with water views and two downstairs. -2-storey, 4 bedroom townhouse that has excellent views of the Murchison River and ocean. 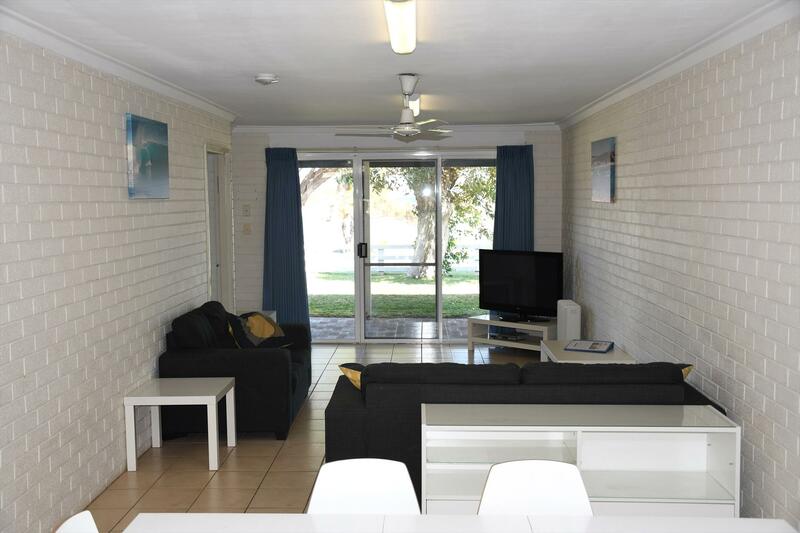 Kalbarri Seafront Villas has the perfect accommodation for a memorable Kalbarri holiday. FOXTEL in all villas. Free secure offsite boat parking with wash down facilities & freezer space. Explore the waterways in the free dinghy provided. Attractive gardens, pool and BBQ area. Direct dial telephones. Internet access. Limited Wi-Fi in rooms available. As a small owner operated outlet, Jamie & Fay look forward to meeting you and helping you out wherever they can. Whether you are exploring all of the natural wonders of Kalbarri, or simply relaxing on the beaches, Kalbarri Seafront Villas will be your home away from home. These units have a great location on the beachfront in the centre of Kalbarri. 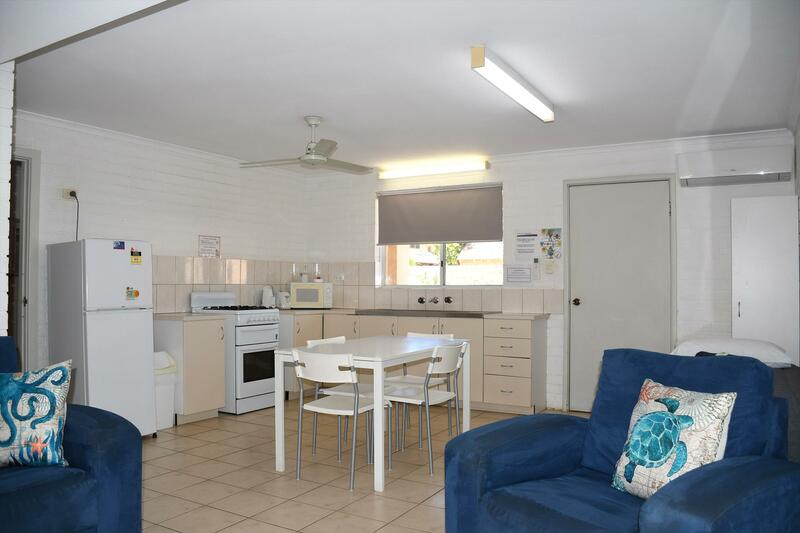 They are fully self contained with well equipped kitchens, a spacious lounge/dining area(well-air-conditioned) , flat screen TV, DVD, Foxtel and FREE WIFI. The main bedroom with Queen size bed is also air-conditioned and there is a single bed in the lounge/dining area. The units are located upstairs, on the second row of the property and have some views of the water from their balcony. They sleep 3 comfortably. Cot or highchair available on request. Happy to take 1 night stay with surchage, call Seafront for availability. These units have a great location on the beachfront in the centre of Kalbarri. 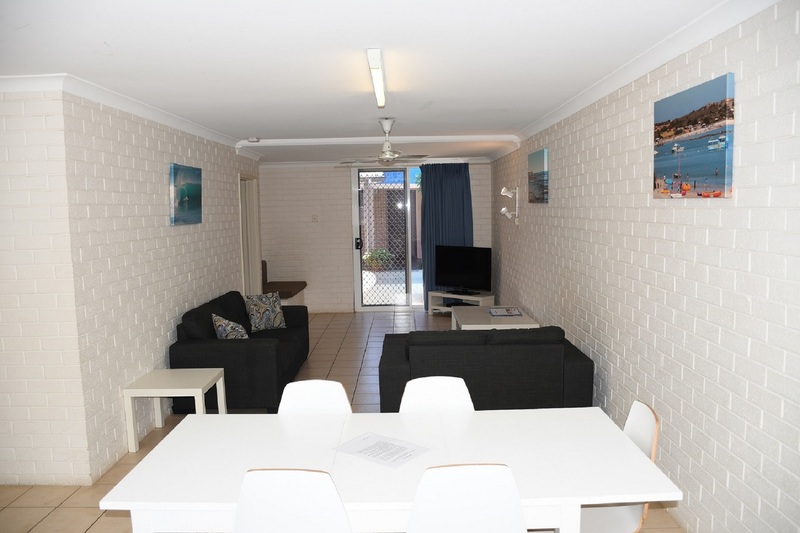 They are fully self contained with well equipped kitchens, a spacious lounge/dining area(well-air-conditioned) , flat screen TV, DVD, Foxtel and FREE WIFI. The main bedroom with Queen size bed is also air-conditioned and there is a single bed in the lounge/dining area. The units are located upstairs, on the second row of the property and have some views of the water from their balcony. They sleep 3 comfortably. Cot or highchair available on request. Fully self contained, ground floor units. Sleeps 3 comfortably. Air conditioned main bedroom with Queen size bed. 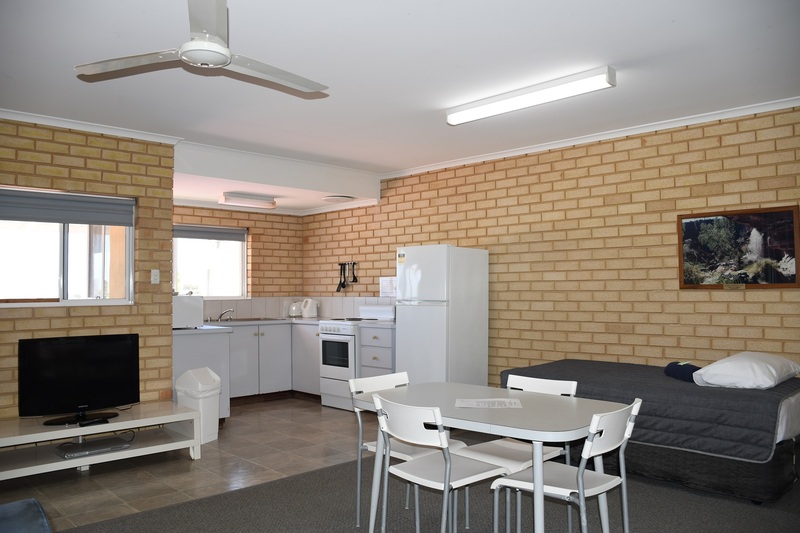 Spacious living/dining area with ceiling fans, comfortable lounges, TV incl FOXTEL, DVD player and FREE WIFI. Cot or Highchair available on request. Ground floor two bedroom units, all with excellent water views. Large and spacious units, fully self contained with well equipped kitchens. Open plan lounge/dining area, comfortable lounges, flat screen TV incl FOXTEL, DVD player and FREE WIFI. Air-conditioned bedrooms, sleeping up to 4 comfortably. Cot or Highchair available on request. Large and spacious ground floor units. Fully self contained with well equipped kitchens.Spacious open plan living area with ceiling fans, incl dining area, comfortable lounges, with flat screen TV incl FOXTEL, DVD player and FREE WIFI. Air-conditioned bedrooms, sleeping up to 5 comfortably. Cot or Highchair available on request. Large and spacious ground floor units. Fully self contained with well equipped kitchens.Spacious open plan living area with ceiling fans, incl dining area, comfortable lounges, with flat screen TV incl FOXTEL, DVD player and FREE WIFI. Air-conditioned bedrooms, sleeping up to 5 comfortably. Cot or Highchair available on request. Happy to take 1 night stay with surchage, call Seafront for availability & price. Large and spacious ground floor units. Fully self contained with well equipped kitchens. Spacious open plan living area with ceiling fans, incl dining area, comfortable lounges, with flat screen TV incl FOXTEL, DVD player and FREE WIFI. Air-conditioned bedrooms, sleeping up to 5 comfortably. Cot or Highchair available on request. Upstairs modern Studio , with balcony views of the water from most. (Not guaranteed) Can sleep up to 3 people comfortably. 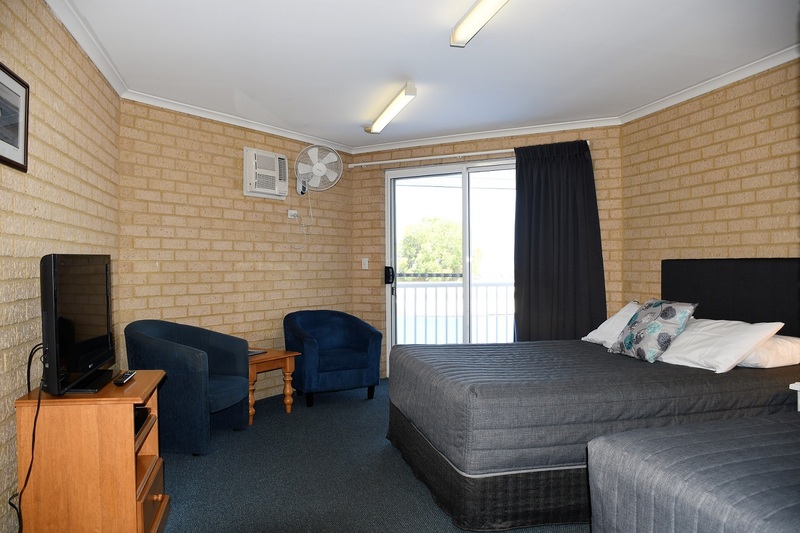 Air-conditioned with wall fan, TV incl FOXTEL, DVD player and FREE WIFI. Kitchenette including microwave, electric skillet, with tea & coffee making facilities, small fridge. Upstairs modern Studio , with balcony views of the water from most. (Not guaranteed) Can sleep up to 3 people comfortably. Air-conditioned with wall fan, TV incl FOXTEL, DVD player and FREE WIFI. Kitchenette including microwave, electric skillet, with tea & coffee making facilities, small fridge. Happy to take 1 night stay with surchage, call Seafront for availability & price. Enjoy sensational water views from the private balcony complete with BBQ! Large 2 Storey accommodation consisting of 4 bedrooms & 2 bathrooms. Fully self contained with well equipped kitchen. Ducted evaporative air-conditioning, comfortable lounges, dining area, Flat screen TV s incl FOXTEL, DVD player and FREE WIFI. The Townhouse will sleep up to 8 people comfortably. Cot or Highchair available on request. Please review the Kalbarri Visitor Centre Terms and Conditions prior to completing your booking https://www.kalbarri.org.au/terms SCHOOL LEAVERS POLICY 1.Will not accept any bookings where all clients are under 18 years. 3.We advise If you still choose to book your accommodation with us and it turns out that you are school leavers or you have school leavers in your party your booking will be cancelled and cancellation fees will be at the discretion of management. For a deposit to be refunded ... 90 Days notice is required prior to arrival date for all School & Public Holidays. 14 Days notice is required prior to arrival date for all other times. All cancellations will incur a 50% cancellation fee & $55 booking centre fee.